Yesterday Blackmagic Design announced that its Blackmagic Production Camera 4K has a new low price of US$2,995 ($3,659 AUD). That’s $1000 less than what was expected. Great news for filmmakers who had been saving their money to purchase the high definition camera. Even better for those who had it on order – as they’re shipping now. “I think this new lower price is important as we really need this camera to supply Ultra HD content into our ATEM 4K production switchers, but live production needs multiple cameras. If the cameras are lower cost, it really helps the live production guys afford multiple cameras so they can build a really powerful live production setup. Initially the cameras will ship with ProRes recording. We are working as hard as we can to add RAW recording quickly and to build cameras so everyone gets their orders asap. We are so thankful for everyone’s patience as we sorted out production for this camera, however it’s great it’s now shipping. It’s exciting to be able to work on a camera like this and I cannot wait to see the work done on it. Time to get a hammer and crack open your piggy bank! Blackmagic Production Camera 4K is a super high resolution 4K digital production camera for Ultra HD television production. 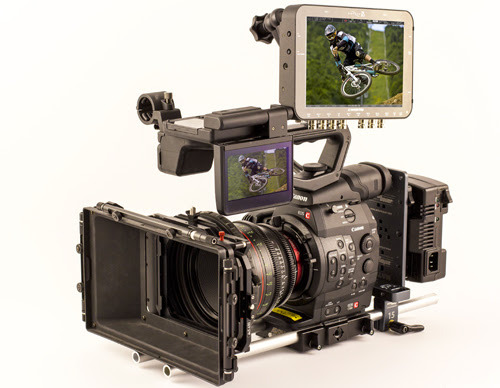 Featuring a large Super 35 sensor, professional global shutter as well as EF and ZE compatible lens mount, the Blackmagic Production Camera 4K captures high quality ProRes™ files, giving customers and filmmakers, a complete solution to shoot amazing high resolution music videos, episodic television productions, television commercials, sport and documentaries. The Blackmagic Production Camera 4K has everything customers and filmmakers need right out of the box including a built in SSD recorder, rechargeable battery and a large 5” LCD touchscreen. In addition to focusing and monitoring shots, the touchscreen also lets customers enter metadata and change camera settings all on a single easy to use interface. Customers also get a full copy of DaVinci Resolve for amazing quality colour grading and finishing for Mac OS X and Windows computers. The Blackmagic Production Camera 4K is available now for $3659 AU$ (Inc GST) from Blackmagic Design resellers worldwide.